Wish to embark on a shopping spree in Ahmedabad? Don’t think much and just come here! Because this is one place where you will get the opportunity to shop your heart out and that too, without boring a hole in your pockets. The place is culturally equipped with artefacts and traditional items on sale within comparatively decent price rates. It is in fact, a great destination to visit if your interest particularly lies in handloom and handicraft items. A nice place to interact with Gujarat’s tradition, thanks to the range of items it embodies including traditional embroidery, dress material and pearl work garments. The place has a festive vibe to it and if you are lucky, you may even witness the folk dance performances that are performed here occasionally. 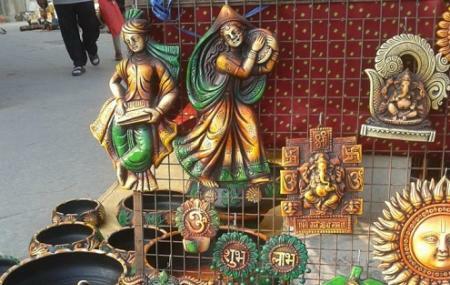 How popular is Ahmedabad Haat? People normally also visit Alphaone Mall while planning their trip to Ahmedabad Haat. Ahmedabad haat is near by vastrapur lake . Gujarat state government maintain this place . Every crafts of Gujrat store hear. creative architecture and treditiotra food is also available in haat. Big parking erea available. Free entry to visit Craft store. Parking: enough space. You can shop for ladies traditional clothes, traditional bags. Food stalls are also there. Many stalls have closed. Things are little costly here. One of the reputed Mukhvas store is there and has very good collection of mukhvas.